The first one was technically a sell out. Well it would have been if we didn’t keep letting people in. This one should be just as big as our resident R&B coverband Joyride & The Accidents, will be sharing the stage with Alphamama. We paid tribute to R Kelly at the first ball, this time expect a mix of classic and new R&B jams being performed by these two amazing soul outfits. Oh and maybe a couple of originals thrown in. That is not all folks. Spinning hip hop and R&B on the night are DJs Levins, Shantan Wantan Ichiban and Joyride. You know this is going to be a proper party just before the Christmas break. It is a Christmas party as well so maybe expect a Destiny’s Child style carol or two, and more drunken random hook ups than even the last one. 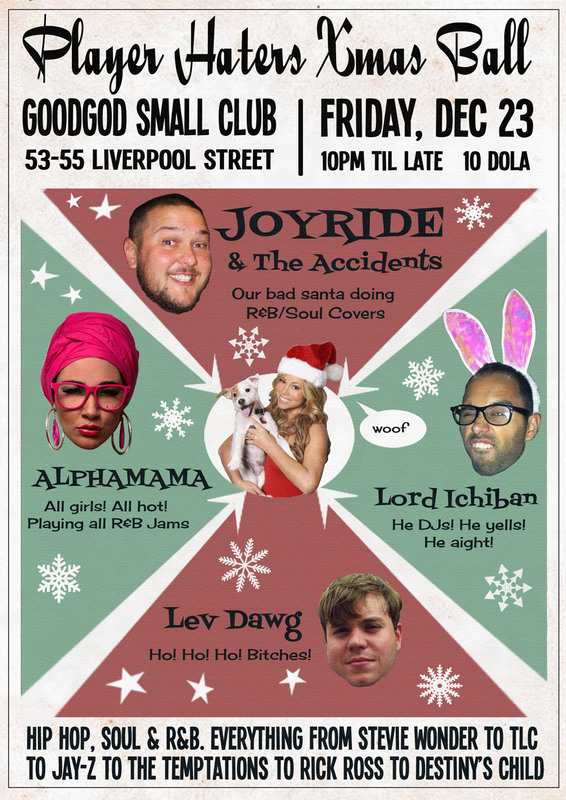 This entry was posted in Events and tagged djs, goodgod small club, hip hop, joyride and the accidents, lev dawg, levins, player haters ball, player haters xmas ball, rnb, shantan wantan ichiban. Bookmark the permalink.